Anarchy & Chaos in a Tribal Textile! 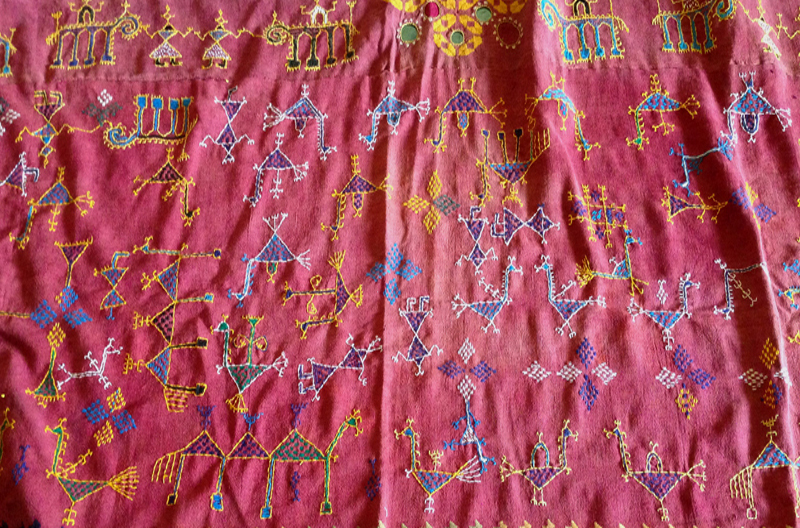 Most traditional textiles seem to follow the patterns that are unique to their tribe. These patterns probably began with some seed of an idea and then evolved over generations to become clear patterns. Given the infinity of choices of evolutionary paths on each parameter, while the seed may have been common within an ethnic group, the probability that two sub-groups within the same ethnic group settled in villages separated by large distances evolved identically is absurdly low. Given that in the past, in the days without the internet, migration of memes faced unsurmountable barriers, the patterns remained within the sub-group. And eventually once the evolution reached a point where they were sufficiently distinct from the others, these became uniquely associated with that ethnic sub-group. Over time, the patterns settled down and remained constant without many changes over the subsequent generations. Textile lovers therefore, within their field of interest, are easily able to pick up a piece and identify its geographic and ethnic origin. It is because we can ‘see’ the order and the pattern. A scarab inside a diamond points us to a Qashqai attribution while a Tigma tie-dye points us to the Himalayan belt. The motifs are usually the first announcers of the identity. But too often, the pattern lies not in the visible layer of the textile but rather within it. It lies in the structure of weaving. Or, the choice of materials. Sometimes, rather than the motifs, the binding factor of a sub-sub-group may be a color preference – dictated by the availability of dyes. And sometimes, pattern lies in the chaos. Whatever the differentiating pattern may be, it is unique to that village or group of villages, while it may still be a subset of patterns common to the larger region. It is a meme within a meme. And so in my journey in the textile world, within the group of shawls that I currently enchanted by, I come upon a sub-group that seems to be different from the others in the group. The chaos in the field in this subgroup exists in none of the other shawls originating in other parts of the state. b. Almost total anarchy in the placement of motifs – no order at all. Just strewn randomly across the field. c. Unique Borders that are similar to that of the parent group but yet different. d. Base material, usage & overall look are similar to those of the parent group. How come there is so much random disorder in the field? Is the naivete of the pattern a sign that the pattern has yet to evolve and settle down? Could it be that these were made by young girls without experience? But then the watchful eyes of the elders would not have allowed the chaos that we see. And although the placement of motifs is chaotic, when we look at each motif there is an organised thought within each … there is no chaos in the idea that was being depicted. Further, the fact that is is an important wedding shawl it is unlikely that these were ‘trial’ pieces. So then,what could be the cause of this chaos? Could this mean that these examples were made by a splinter group that is younger & inexperienced? Folk legends and literature on nomadic tribes offer us many cases where whole populations moved away suddenly under hostile conditions. In such cases the old and infirm remained behind and the new generations had to re-establish life & traditions elsewhere without the guiding hands of the elders. Could this be a reason? The dealers do not know. And I do not know. And as we move further away up the supply chain, the further we move from the knowledge of how this came to be. The hope lies in going and meeting the people of the tribe that created this. And, how shall we pick them out from the thousands who are all wearing jeans and t-shirts today?! ESPECIALLY since we do not even know which sub-group made these! Too many questions for one morning! Better get back to other life to find simple answers to simple questions such as “where is my breakfast”. 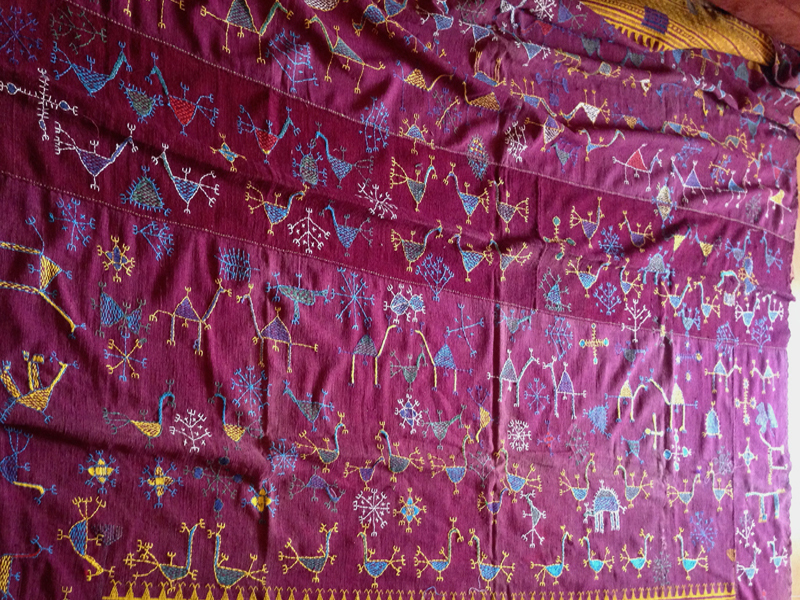 This entry was posted on February 27, 2015 by wovensouls in Art Kaleidoscope and tagged antique art, Antique textile, antique textiles, antiques, art, artwork, Asia, costume, migrations, textie migration, textile art, textile ethnography, textile origin, tribal textile.